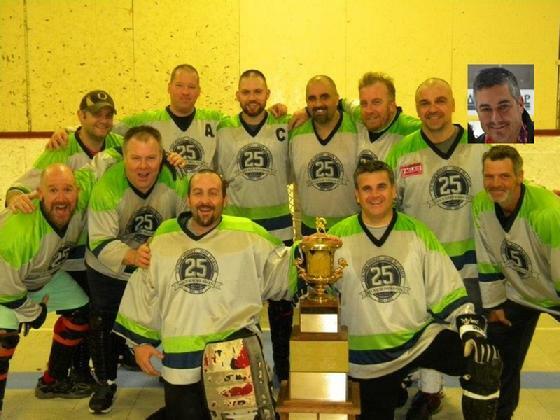 It doesn’t happen often in the Over-30 league but every so often the Hockey Gods step in and determine the fate of one team and carries them to a championship. It’s not because they finished as the best regular season team, or that they have the most talented team. It’s because the entire team plays hard every week (regardless of their record and place in the standings) to prove everyone wrong and believe that they can win the championship. Such was the case for 11 Guys, 1 Ball. The last time such a situation occurred was back in the winter 2010 season with a team called J.A.F.H.T. In a very closely played game that either team could have won (don’t be fooled by the final score as two open net goals were scored), 11 Guys, 1 Ball held on to defeat the Pylons by a 5 – 2 score. Led by their first year captain Dominic Defrancisco’s efforts and leadership style, 11 Guys, 1 Ball did the unexpected by qualifying for the playoffs on the last game of the season, then upset the heavily favored number 1 playoff seed, before capping off their season with a championship victory. Right from the start you could tell that both teams came ready to play and wouldn’t sit back or play conservatively. It was the defense more than the offense for both teams that was controlling the play between the white lines. And it was the defense that gave 11 Guys, 1 Ball the early lead only two minutes in. After some strong possession cycling play by Carlos Machado and Dominic Defrancisco down low, they spotted defenseman Alex Leone on the right point. Alex’s bomb from the point quickly found the back of the net, giving his team the important early jump start they were looking for. For Alex, it brought him back to his East Boston Leominster tournament playing days with that goal. Not thrown off by this goal, the Pylons stuck to their game plan of fore checking the defense of 11 Guys, 1 Ball, which paid off just over four minutes later. Pat Pirone, after receiving a pass from Tony Mastrocola, made a cut move down the right wing between three defenders and with a defenseman all over him and falling down, Pat chipped his shot top corner over the goalie to get his team back into the game and tie it at 1 – 1. It was a great individual play and finish. At the end of the first period, the Pylons had a 12 – 9 edge in shots. As the second period played out, it became apparent that the Pylons second line was playing better than their first line, putting pressure on the defense of 11 Guys, 1 Ball while generating scoring chances. Not to say that their first line wasn’t doing anything; they just weren’t generating the scoring chances. This was still either team’s game to win. Each team was attacking the number two defensive pairings of each team with some aggressive fore checking to generate scoring chances. This game turned in favor of 11 Guys, 1 Ball suddenly and quickly as a direct result of that halfway through the period in one of the game’s defining moments. At 4:21 John Leite’s hustle behind the net after retrieving a pass from Carlos, found Dominic covered by two defenders in the slot and Dominic still managed to power his shot into the net, even with the defender tying up his stick in the process. With a surge of momentum, 11 Guys, 1 Ball didn’t sit back but went for the dagger only twenty seconds later, as Ray Dow let go a bomb from the point after some back and forth passing by Tony Medeiros and Shawn Wyatt. This goal stunned the Pylons who appeared to be reeling. This was the second time during the playoffs that Ray had scored a key goal in the game from the point late in the second period, as he did the same thing in the semi-finals, scoring with only three seconds left to change the outcome of that game. Ray’s goal was one of the two defining moments of the Finals. At the end of two periods, 11 Guys, 1 Ball held a 3 – 1 lead while the Pylons held a 22 - 19 advantage in shots. Perhaps finally realizing what was at stake here in the third period, and needing to play more desperate hockey to get back into this game, the Pylons had all three forwards fore checking putting even more pressure on the defense of 11 Guys, 1 Ball. The strategy paid off at 7:59 as Anthony Lauletta was set up by Nick Romano and Steve Witkus, to bring his team back within a goal. Re-energized by this goal, the Pylons were coming on with the offense, but, as they had done so effectively throughout this game, 11 Guys, 1 Ball always found a way to either block the shots of get a stick in the way to deflect the shots. This was evidenced about halfway through the third period as Shawn Miville came down the left wing, set up the defense to the outside then made a quick cut to come across the middle twenty feet out for an open shot, only to have his shot deflect off a stick and roll harmlessly into the corner. Even the players on the bench of 11 Guys, 1 Ball had that “Holy Sh**” look when Shawn made that move. With around four minutes left to play in this game, the second defining moment of the Finals took place for 11 Guys, 1 Ball. On an ensuing scramble around the net and bodies flying all over the place, the ball came out to Anthony Lauletta in the right slot about fifteen feet dead on whose shot was heading into the open net when somehow goalie Scott Rosato managed to fight through the screen of players to just extend out and get a piece of that shot to prevent a sure goal. This was the save of the winter 2016 season and came at the most important time! With under a minute to play, the Pylons pulled their goalie and were pressing for the tying goal, when the pass from the left boards back to the point jumped over the stick of the defenseman and rolled into the open net with forty-seven seconds left giving 11 Guys, 1 Ball a 4 – 2 lead. Once again we mention about the Hockey Gods and fate stepping in here. Still playing with an open net, Tony Medeiros was set up by Dominic to seal the victory with only five seconds left to play. The final score was 5 – 2 in favor of 11 Guys, 1 Ball, with the Pylons outshooting them by a 34 – 31 margin. On the way to the Finals, 11 Guys, 1 Ball as previously mentioned had to win their last game of the season over Shark Attack just to get in to the playoffs, then shocked and upset the number 1 seed in Yellow Submarine for a stunning 4 – 3 overtime win as Dominic scored the game winning goal only seven seconds into OT. Ray Dow had a goal and two assists, including that crucial goal scored with only three seconds left in the second period. For the Pylons, in an evenly matched game with Sour Grapes, Shawn Miville scored his second goal of the game on a bomb from just over the center line with just over two minutes left to play to lead his team with a 3 – 2 win. For his efforts throughout the playoffs, first year team captain Dominic Defrancisco of 11 Guys, 1 Ball was named the Playoff MVP. Dominic had 2-goals, 2-assists in the playoffs and was tied atop the leading scorers. Make no mistake about it, this 11 Guys, 1 Ball team IS Dominic’s team! Congratulations to the Portuguese Power trio of Dominic Defrancisco, Tony Medeiros and John Leite on their three-Peat and winning the last three championships in the Over-30 league. Congratulations to Shawn Wyatt and Alex Leone on winning their first-ever championship jackets. Congratulations to Ray Dow on completing the “Triple Crown” or the “Trifecta of Championships” – the winter 2016 Over-30 league championship, the 2016 US Nationals Masters Division Championship and the 2016 “Yellow Team” Cambridge League Championship. As a team, congratulations to 11 Guys, 1 Ball for their winter 2016 championship, whose players include: Captain Dominic Defrancisco, Tony Medeiros, John Leite, Carlos Machado, John Mastrocola, Shawn Wyatt, Scott Young, Ray Dow, Alex Leone, Brien Sullivan, Mike Delorey and goalie Scott Rosato.